Panda Express Black Pepper Chicken Copycat Recipe – a delicious Chinese inspired dish based off Panda Express’ popular black pepper chicken! Tastes just like it is from Panda Express but a million times better with tons of garlic and black pepper chicken flavor for dinner the whole family will love – faster than it takes to pick up takeout! My daughter’s absolute favorite fast food on earth, hands down, is Panda Express. She loves the chow mein, the orange chicken, the broccoli and beef – and she really, really loves the Black Pepper Chicken. It’s full of flavor, gluten free, lower calorie, and low carb – making it one of my favorite Panda Express dishes too. 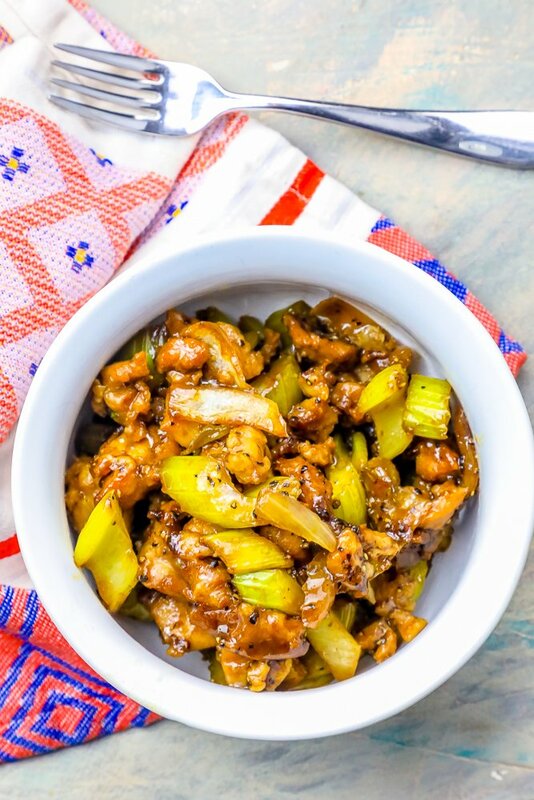 This Copycat Panda Express Black Pepper Chicken recipe, complete with celery and onions and a thick, rich, and tangy black pepper sauce is my go-to now anytime we’re craving Panda Express! This easy Black Pepper Chicken recipe can be made in less time than it takes to drive to a Panda Express – and tastes about a million times better than takeout. 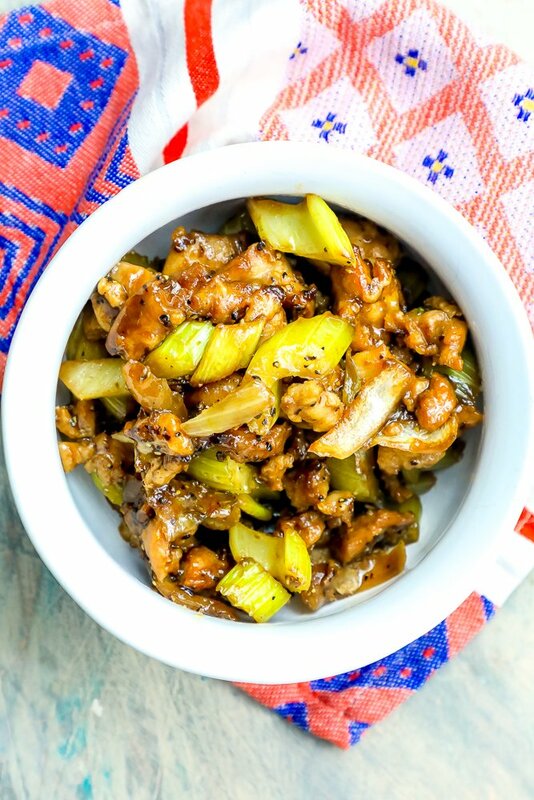 It can also be made to work into a paleo diet or keto diet, since it is naturally gluten and grain free, and low carb – making this a healthy and delicious Copycat Panda Express Recipe! JUST TAKE ME TO THE PANDA EXPRESS COPYCAT BLACK PEPPER CHICKEN RECIPE ALREADY! If you’d rather skip my (very helpful, i think) tips and tricks, essential cooking info, and similar recipe ideas – and get straight to this deliciously easy black pepper chicken recipe – simply scroll to the bottom of the page where you can find the printable recipe card. Black pepper chicken is a delicious Chinese inspired dish popularized by American Chinese restaurants. 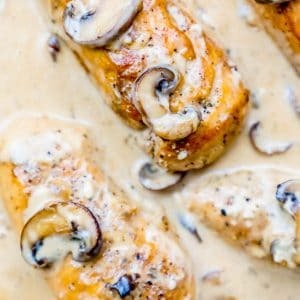 While many black pepper chicken dishes Americans love aren’t traditional Chinese cuisine (American style Chinese food is thicker, has more sauce, and tends to combine ingredients not usually combined in regional Chinese dishes , the dish has become a staple on many Chinese restaurant menus. Panda Express is well known for their black pepper chicken as it is one of their lighter offerings and is also gluten free – but it is a bit of a departure from more traditional Chinese black pepper chicken offerings since it is a lot thicker and has a lot more sauce. 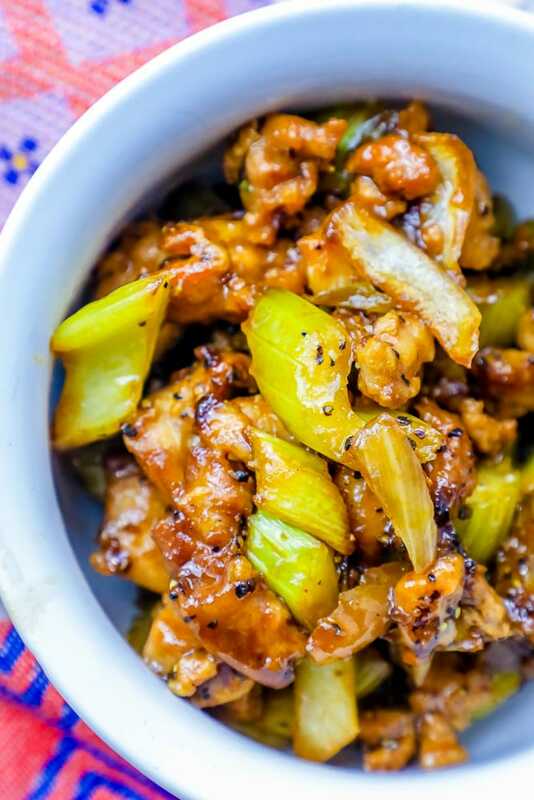 This Panda Express Black Pepper Chicken Copycat Recipe is light, delicious, and full of flavor – it is a bit spicy and tangy, and has a deliciously rich garlic flavor that will quickly make this simple black pepper chicken dish a huge favorite with your family! Black pepper chicken is one of the easiest Panda Express copycat recipes to make – most of it is mixing the sauce and then pan frying the chicken and vegetables. 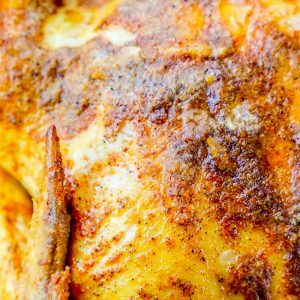 There are a couple of tips and tricks to make sure your black pepper chicken turns out perfect, every time! This chicken tastes best when diced small and cooked very hot and very fast – make sure you’re using a large pan or wok and high heat to cook your chicken quick! You want your chicken to pan-fry, NOT boil. If your pan is smaller, cook the chicken and vegetables in batches to cook everything quickly – then add back into the pan to toss with sauce to come together. -Soften Vegetables, but not too much. Your vegetables should be softened – but not cooked to soft! Slightly crunchy vegetables give this dish a perfect fresh and crunchy texture that everyone loves. -Slice celery on a diagonal for more bite. To slice your celery like panda express, lay the celery face down (like an upside down U) on a cutting board. Slice celery at an angle towards you to make larger wedges instead of thinly sliced half-circles for more crunch just like Panda Express serves theirs. -Don’t add the sauce until the end. 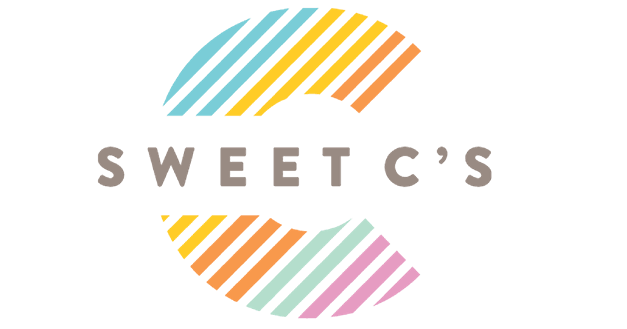 Don’t add the sauce until your dish is done – we want to warm the sauce and let it coat the chicken and vegetables – but we don’t want the sauce to overcook the food and turn it mushy after pan frying. 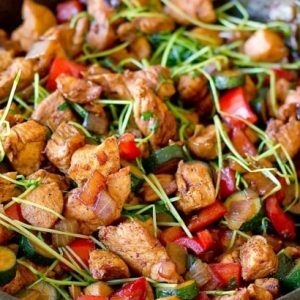 While many Chinese inspired dishes in America aren’t actually very healthy and are known for being a bit heavier and oily, this black pepper chicken is a smart choice for those looking to indulge their Chinese food chicken cravings without a heavy or calorie and fat laden nutritional profile like other Americanized Chinese food dishes. 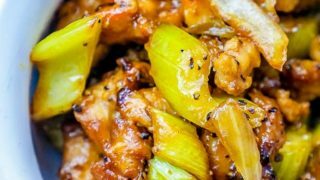 Black pepper chicken relies on fresh vegetables and dried herbs as well as a few sauces to come together with a rich, hearty, and indulgent flavor that doesn’t include soy, gluten, or much sugar as other Americanized Chinese food dishes normally have. 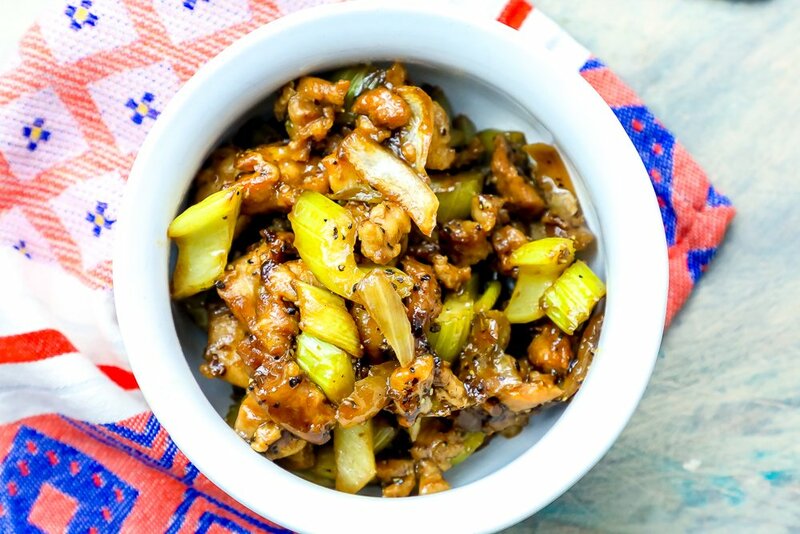 This Panda Express Black Pepper Chicken Copycat recipe is a healthy Chinese food inspired dish that works well in low carb and low calorie diets, and can easily be made even healthier with a couple of swaps outlined below. 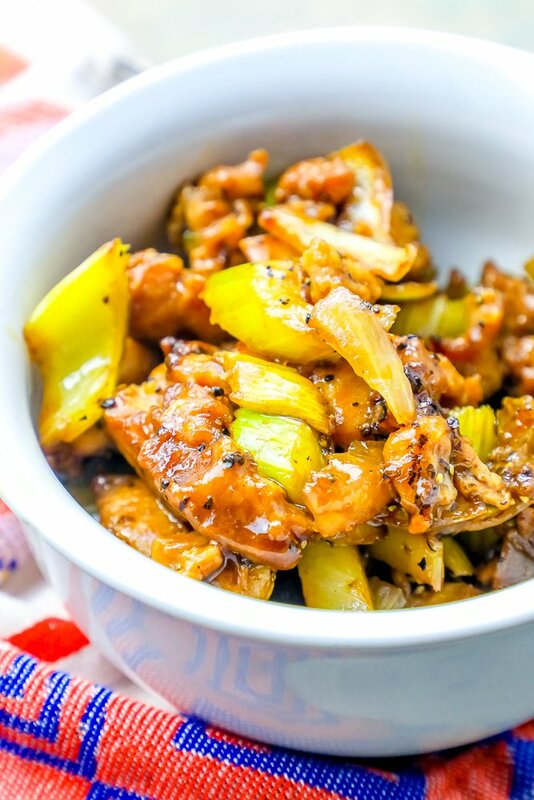 This easy and delicious Panda Express Copycat Black Pepper Chicken recipe is naturally gluten free – and can easily be made to work in a paleo diet or keto diet, too! This recipe can be naturally low carb – but I’m outlining a lot of swaps you can try if you’re looking for some substitutions! or my preferred option: skip it entirely and just pan fry chicken without dredging. 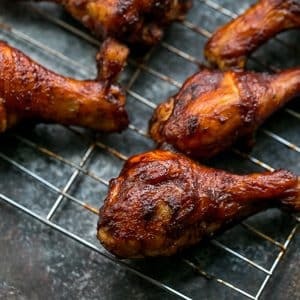 If you opt to just fry the chicken, it will have less of a coating and the sauce won’t get the extra starch, making it a tiny bit thinner, but the flavor will still be out of this world. Whatever option you pick is entirely up to you! If you love this Panda Express Black Pepper Chicken Copycat Recipe as much as I do, please write a five star review, and be sure to help me share on facebook and pinterest! Panda Express Black Pepper Chicken Copycat Recipe - a delicious Chinese inspired dish based off Panda Express' popular black pepper chicken! Tastes just like it is from Panda Express but a million times better with tons of garlic and black pepper chicken flavor for dinner the whole family will love - faster than it takes to pick up takeout! In a large bowl, mix together and set aside. Pat chicken dry and cut into 1" cubes. Place chicken in bowl, and toss well in cornstarch, pepper, and salt. Heat peanut oil over medium heat in a large skillet on medium high until shimmery. 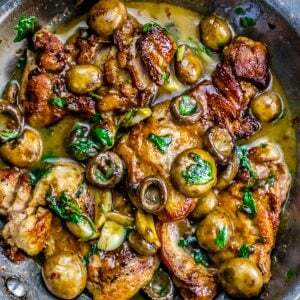 Add chicken to oil in small batches so it can cook quickly - don't overcrowd pan. Remove chicken from pan, place on a plate and repeat the sauteing process with the rest of the chicken in batches until done. Place all the chicken back into the pan and add vegetables, saute for about 5 minutes until vegetables are tender. Add sauce and broth to pan, bring mixture to boil, reduce heat and simmer for about 10 minutes. Serve over a large bowl of rice and enjoy! Very tasty! I did a few tweaks to not have to go to the grocery store to buy more ingredients. I added tofu for more protein and used fresh minced ginger. I will definitely be making this again! I made this last night, with ramen noodles, and it was quite yummy. I’ve never had this from Panda, so I wasn’t entirely sure what to expect. I’m not sure if I messed up the proportions of the sauce a bit (I had started trying to halve the sauce, and then gave up on that, but the additional water from more broth would have boiled off anyway… :/ ) and made it too peppery, but it was definitely better for lunch today when I had a large glass of milk to drink after every bite! lol. So, for anyone who has a slightly more sensitive palate, maybe start with less pepper and chili powder, and work your way up. Our mouths were numb without the milk. All in all, I’ll probably make it again, but cut the chili and pepper a bit for our tastes. Quick question. Where/when should I add the seasonings to the chicken and vegetables? I don’t see them mentioned in the instructions. 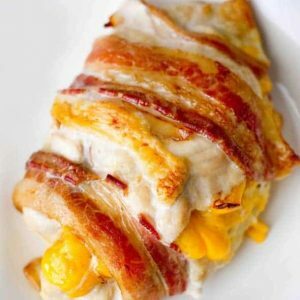 This dish sounds delish and I want it to become a family favorite. Caught my omission – it’s when you dredge the chicken. Thanks for letting me know!